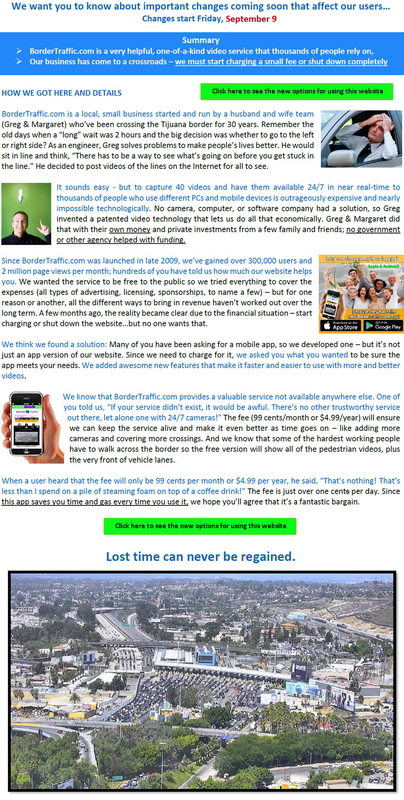 At BorderTraffic.com, our aim is to help you make the most of your time, and in turn, give you freedom to do things which are more important than sitting in a border line. Whether you chose Standard or VIP Membership, registration is EASY and FAST! VIP Membership gives you access to any available video of the Sentri/Fast/Nexus lanes at select locations (be sure to check availability for your particular location). Even though these lanes were designed to speed up border crossing for people who have regular business on both sides of the border, we all know that at times they are just as long, if not longer, than the standard crossing lanes. The VIP Membership costs just $6.99 per month and is easily set up to automatically renew without further effort on your part. The fee pays for itself many times over through savings of time, gasoline, frustration, etc.